Over a billion people world wide lack any safe drinking water. As a result almost two million children world wide die each year of diarrhea, and over 4 billion people are sickened by contaminated drinking water. In some area of the world 40% of all hospital admissions are due to diarrheal disease. Dangerous organisms can be killed by Pasteurization at 160 degrees F. Simple solar stoves can easily Pasteurize water in most parts of the world, making it safe to drink. 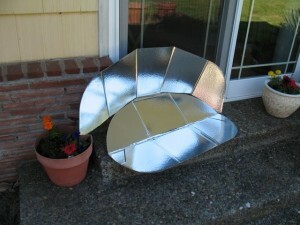 Solar stoves can also cook nutritious meals in a few hours without use of firewood or gas. The stove is set up in a sunny area during mid-day. A dark cooking pot absorbs the heat from the sun and a clear plastic bag prevents breezes from cooling it. A simple wax temperature indicator shows when the liquid is hot enough. There are many possible designs and Agua Pura Para El Pueblo has conducted workshops in Mexico and the US teaching people how to make these simple stoves.